Make a distinctive statement that yours is a truly musical home! 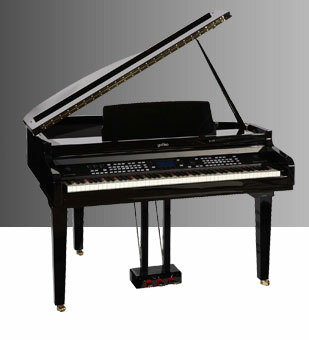 The Galileo Grande II offers you the magnificent style of a baby grand piano while allowing you to enjoy incredible and easy-to-use musical features. You'll enjoy the realistic 'feel' of an incredible variety of rhythm styles and sounds. You'll sound like a 'Maestro' as you easily add “intros”, “fills” and “endings” - creating fantastic music in any musical style you desire. Record your own compositions in a flash – and store them on the built in SmartMedia Card or Floppy Disk Drives. All of these features are elegantly incorporated in a luxuriously handcrafted ‘baby’ grand cabinet with two-piece lifting piano lid with dual props, roll top key cover and caster wheels. The Galileo Grande—Distinction and Entertainment all in one!